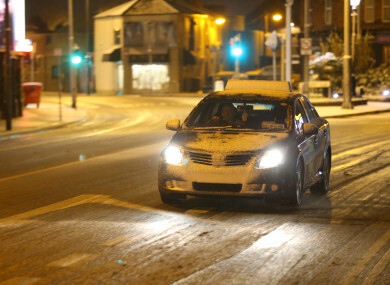 Motorists are advised to take extra care, and people are being reminded to check in on elderly neighbours and relatives. PEOPLE ARE BEING advised to be cautious ahead of extremely cold weather forecast for this evening and tomorrow. A forecast of up to 3cm of snow has been given for Leinster, Cavan, Monaghan, Leitrim, east Cork, Tipperary and Waterford between 6pm this evening and 4am tomorrow; while a nationwide warning has been issued for snow showers (that comes into effect from 6am until midnight tomorrow). According to Met Éireann, temperatures in Dublin have already fallen below freezing (currently -1°C in Phoenix Park & the Airport). Temperatures in Dublin have already fallen below freezing (currently -1°C in Phoenix Park & the Airport). The Road Safety Authority is warning motorists to exercise caution on the roads today as hazardous conditions on roads and footpaths are expected – particularly in the east. Alone Ireland, which represents the elderly who live at home, advised people to check in on their neighbours and elderly relatives ahead of the cold weather. There are lowest temperatures of between -3 and -5 degrees forecast in many parts of the country. Sharp and severe frost and icy patches are expected. The RSA and An Garda Síochána are asking road users to check local weather and traffic conditions and be aware of the conditions before setting out on a trip. Gardaí warned that there may be hazardous conditions on roads and footpaths in Leinster, Cavan, Monaghan, Leitrim, East Cork, Tipperary and Waterford. Clear windows and mirrors before setting off. Carry a screen scraper and de-icer. Watch out for black ice, as it is difficult to see. It can occur especially in sheltered and shaded areas on roads. Remove all snow from the vehicle before setting off. Snow left on the roof will become loose and can drop onto the windscreen during braking, causing sudden and severe restriction to the driver’s vision. Allow extra space between you and vulnerable road users such as cyclists. Drive with dipped headlights at all times. Check your tyres before heading off. Do not drive on the tail-lights of the vehicle in front of you. This can give a false sense of security and you will be too close to brake safely. Gardaí added that motorists should not leave their cars unattended with the engine running, as a number of car thefts happen every frosty morning. The RSA is also asking pedestrians, cyclists and motorcyclists to wear bright clothing with reflective armbands. They are being asked to take extra care when crossing the road or cycling in extremely windy conditions. Finally, pedestrians are being asked to walk on a footpath, not on the road. If there are no footpaths, they are being asked to walk on the right-hand side of the road, facing traffic. Email “Icy showers and up to 3cm of snow forecast as authorities issue safety advice”. Feedback on “Icy showers and up to 3cm of snow forecast as authorities issue safety advice”.